Some of you were born organized – I wasn’t. I’ve had to work hard to remain above the fray of chaos. And one of the biggest ways I’ve improved my organization is with meal planning. My own journey with meal planning began in earnest about 15 years ago. I love to cook, and my family and I enjoy entertaining. But cooking and entertaining can be complicated. There was one moment that was the breaking point for me. It was near Christmas, and there were a number of extra events happening in our house. Dinnertime was approaching, and I was just getting ready to make a recipe when I saw that — yet again — I needed to head off to the grocery store for one particular item. As I pulled in to the parking lot, it dawned on me that it was the seventh day in a row that I’d had to go to a store for some ingredient I didn’t have. There were so many other ways I’d have preferred to spend my time. I made a decision that day, pulling out of the parking lot for what felt like the one millionth time, to get organized. I realized that most of my last-minute grocery store runs were preventable. If I just planned a little better, anticipating what I’d need for a week of meals, than I could go shopping once a week rather than daily. What an amazing difference for me! The big idea with meal planning is that you decide in advance what you’re going to cook for dinner, write it down, and then use a simple meal plan to determine your shopping list. It may sound strange, but I believe that the biggest hurdle for most of us is the act of deciding what to make for dinner. Luckily there are a huge number of resources out there for you. Whether it’s a cookbook, or a good website with recipes you like, I guarantee that there is a resource that will help you decide what to make for dinner. When I fully implemented this simple organizational tool it felt like a small miracle. 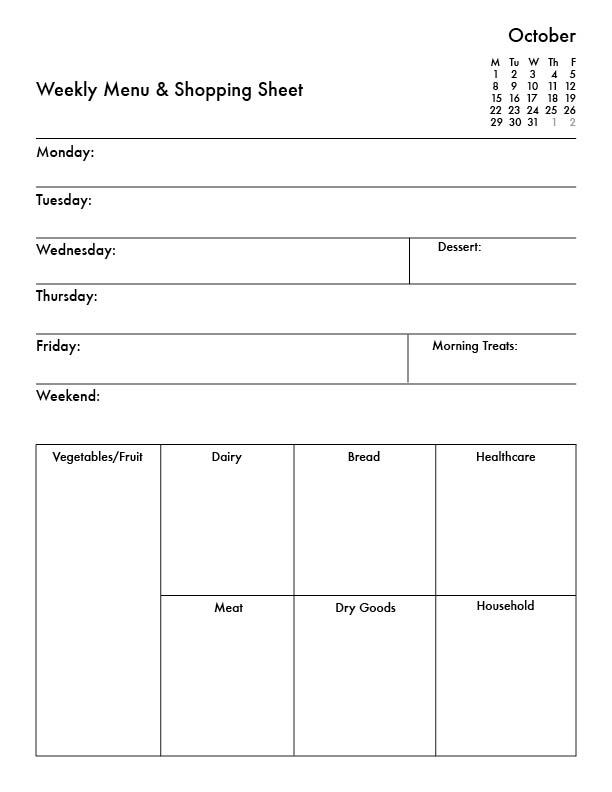 I like to keep things streamlined and simple, and developed a one-page meal planning sheet that serves as my Weekly Menu Plan and Shopping list all in one. I created this using InDesign, and it’s very much tailored for my family’s life. This system works for me, as it’s just enough of a prompt to get me to decide what to make for dinner and my shopping list flows from what’s on the menu. I’ve also got two weekly events that I provide baked treats for, and so I’ve included these in separate sections as well. Weekends at our house are less structured, so I rarely plan for weekend evenings. Your week will look different than this – so I encourage you to create a system that works for you. Impressive – one of your best posts ever! Penny, I did this during the season of life when I was able to keep all the plates spinning, and looking back, it was probably a significant part of keeping all the plates spinning. About three years ago, when things began to really come unravelled around here, I stopped cooking altogether, and things got even worse. Even thinking about meal-planning feels like a step in the right direction for me, a step toward “normal” again. Thanks for reminding me that it is possible. Thanks so much for reading Valerie! You are an inspiration to me.